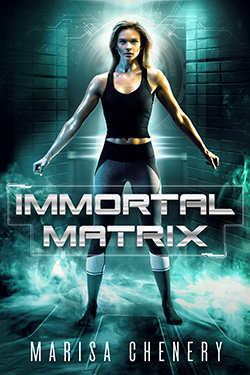 In the year 2217, Amarah is a donor for the Immortal Matrix, practically a slave, owned by a pharmaceutical corporation. Almost eighteen, she’s destined to be joined to a recipient to keep them young and fit while she does all the work. Her life is grim, except when it comes to a boy in her pod, Dyer, who means more to her than is allowed. Amarah and Dyer are sent to the pool of donors early, and their lives and feelings for each other are put to the test. She gets caught up with a group that wants to end the Immortal Matrix, and soon will find out how strong she really is, and how far she’ll go to keep Dyer as her own. Amarah hadn’t known any other life. Since birth, she’d been raised in the best conditions to guarantee a healthy body and brain. She had a role to play. One she’d been born into. She set her gaze to the transparent screen that projected out of the top of the treadmill she jogged on. It displayed a documentary about the twenty-first century, a time before she’d been born, and before the Immortal Matrix had been created. A world that no longer existed in the year 2217. Amarah turned her head to the left to look at the girl who ran on the treadmill next to hers. She was the same age as Amarah. Instead of long, blonde hair like Amarah’s, Lucy had red, but they each had blue eyes. They wore the same clothes—dark gray form-fitting athletic pants and light gray tank tops. The boys in the room wore that outfit as well. Amarah scanned the room and noticed two treadmills were empty. That could only mean Brent and Claire were being punished. Not physically, since their handlers would do nothing to jeopardize the profit those two would bring in once they reached eighteen years of age. Everyone in the fitness room was part of the donor class, or slave class as Amarah thought of it. They were of the same generation, all seventeen, almost eighteen, and were the donor half of the Immortal Matrix. Not that they had any choice about it. It was true. The pair’s closeness would have been noted by the handlers. Intimacy of any kind between donors was strictly forbidden. In their station, all aspects of their life were dictated to them. They had no choices, were never offered a chance to plan how they wanted to live as other people did. Especially, like the rich. Amarah turned her gaze back to the documentary, which she didn’t really pay too close attention to. Lucy kept talking about Brent and Claire. Amarah was finished with that subject. What was done was done, and thinking about the pair wouldn’t change anything. One of their handlers stepped into the room and went to stand in the front where everyone could see him. They had two handlers—a man and a woman. Their pod had fifty donors made up of twenty-five girls and twenty-five boys, the number and ratio was the same for each pod. Cliff was Amarah’s pod’s male handler, and had been with them since their birth. Most handlers watched over two pods during their careers. This was Cliff’s first, and once all the donors reached the age of eighteen and were part of the Immortal Matrix, he’d start with a bunch of newborns again. Amarah quickly did as requested, as did all the others in the room. In an orderly fashion and silently, they formed a two-row semi-circle around Cliff. His gaze briefly settled on each one of them. Brent and Claire wouldn’t have a chance to be together—ever. Donors were watched more closely in the pool, and in the adult pods, than in the juvenile pods. Unsanctioned pregnancies were to be prevented at all costs. Donors had no choice when it came to reproducing, which was decided not by nature but by those higher up in the pharmaceutical corporation that owned them. Amarah looked at the others as Cliff continued to speak, stressing how important it was to follow the rules. Her gaze landed on Dyre, a boy who would turn eighteen two days after she did. His brown hair was cut short, same as the rest of the boys. His green eyes were focused on their handler. As if he felt her staring, he flicked them in her direction for a brief second. They were friends, but in the last couple of months he’d been doing his best not to interact with her. She didn’t know why. She focused back on their handler. Cliff wound down his speech, then dismissed them to continue with their scheduled timetable. He walked out of the room, and her pod spread out either continuing their cardio exercise or heading to the various weight-training machines. Amarah went to the latter. She’d done the minimum of cardio that she needed to do for the day. She preferred the weight training. The pull and strain on her muscles somehow always settled her mind. Lately, she’d been thinking too much for her own good. It mostly had to do with her birthday looming so close. She’d be eighteen in two months. Her life would drastically change on that date.